Our reviews will not be the normal kind of review that you usually see about an artist release. These will be different as we will be aggregating all sources available…320kbps(Lossy Audio taken from the CD FLAC Rip), CD (EAC Lossless 16Bit/44.1kHz Rip), HD Tracks (Hi-Res Digital Downloads from 24/96 to 24/192), 24/48 ALAC Hi-Res Apple Lossless, Vinyl Rips (Often from different countries & each transferred by different rippers with different set-ups), as well as other high quality sources as the become available such as Pono music. That’s not to say I will not add any subjective commentary(I’ll be open as to what I like and do not) but I will try to remain as objective as possible. As we know music listening is a very subjective, or personal experience, therefore I will try to stick best with theory to give you what I believe is the best format to own of any given release. 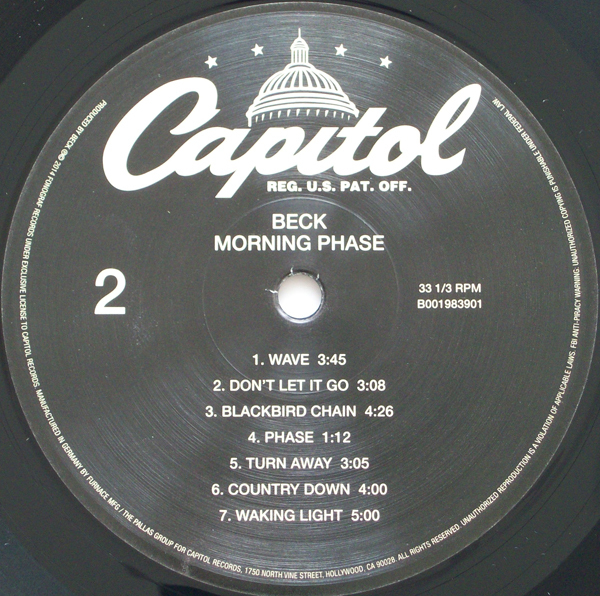 Beck – Morning Phase / “320 MP3 Vinyl Experience Download” (Provided on the card that comes with the Vinyl Purchase. To start if you are a noobie then then the 320kbps (Lossy Audio taken from the CD EAC FLAC Rip) and the CD might be fine for you but I will explain why technically these are not the best sources, making a distinction between the “320 MP3 Vinyl Experience Download” that comes with the vinyl and the “320kbps” taken from the FLAC EAC Rip of the CD. Upon first listening to the CD I find it extremely loud “Search for Loudness Wars”, overly compressed, poor dynamic range (DR 6), and lots of peak limiting w/ controlled clipping. Not Recommended…however I am amazed by the release itself. I believe it is and will remain the best release this year. This is Beck’s best release ever IMO…but I had to find another source. Obviously the 320kbps converted from the FLAC EAC CD is even worse in all the aforementioned areas…Ear fatigue city! 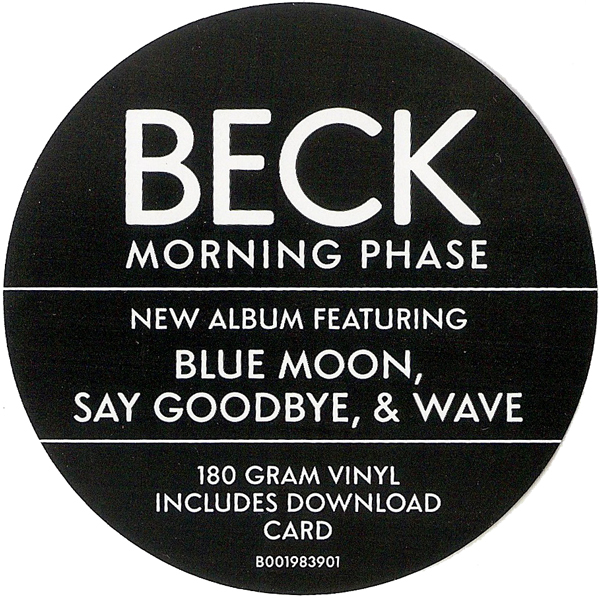 Next I’ll review, Beck – Morning Phase / Official “320 MP3 Vinyl Experience Download” (Provided on the card that comes with the Vinyl Purchase). It is called the “320 Vinyl Experience” because it seems to be sourced from the vinyl master and has surface noise just like vinyl. Also you can hear the run in and out as well as the sound of the needle dropping as if you are listening to the vinyl albeit here in the digital realm. This release even at 320kbps sounds much better than the CD (EAC Riped to FLAC), it is still overly loud but not as loud as the CD. The Dynamic Range is much better (DR 9) but it is also Brickwalled/Clipped…so we are halfway there to a great experience. 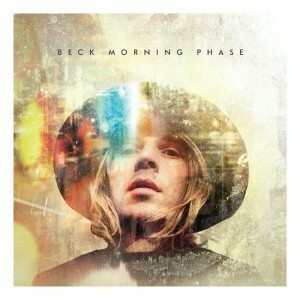 Now for Beck – Morning Phase / HD Tracks (Hi-Res Digital Download) 24Bit/96kHz. This release was supposedly mastered by Robert Ludwig and I am surprised that Robert would release this, as amazing at mastering he has been in the past, here he seems as if he’s losing his ear. The Hi-res official format does not breathe, is overly compressed, and is brickwalled as well. It seems as if all of the formats reviewed up until this point are taken from a digital master. If anyone has information on it being from analog tapes please let me know. Regardless, I do not recommend this release in terms of both listening for sound and by sight using a spectrograph analyzer…the files are lackluster. At this point I would only recommend the “Official 320 MP3 Vinyl Experience” Download (Provided on the card that comes with the Vinyl Purchase), and that is tenuous. 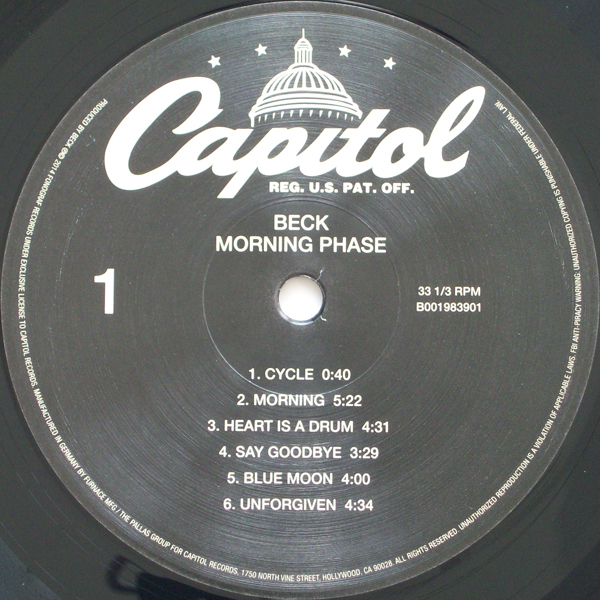 Last but not least Beck – Morning Phase / Vinyls #1, #2, & #3 (2014) (Original Capitol U.S.Bernie Grundman / German Pallas Pressing) Vinyl Rip > Transferred to 24Bit/96 FLAC. All the vinyl releases were ripped on different setups…and finally we come to the best sounding release of them all (I’m sure this is not a surprise). Although all 3 vinyl rips are still overly compressed and slightly to loud, there is not any clipping which is the MO usually on vinyl. The Vinyl versions were cut, again as it sounds from digital masters…correct me if I’m wrong and has a better DR (DR 10). Remember though the Vinyl DR often has +1 bump because of the surface noise and it’s conversion. Usually I would review each vinyl release separately but they are all the same pressing. The vinyl was cut by Grundman Mastering in Hollywood (Excellent)…but where it gets dicey is when Pallas does the pressing. Uncharacteristic of Pallas as they are known for superiority, each vinyl release has differing amounts of surface noise and only one of the 3 sounds quiet after some light click repair. So what I recommend is that you buy the vinyl release and that way you will have the “320 Vinyl Experience Download” and the vinyl for your collection until you either can make your own vinyl rip or find one that a Master Ripper can provide. Both beat out all other formats at the moment…I do not see the that changing until an SACD version becomes available. The reason I say that is because for Beck’s 2002 release “Sea Change”, the SACD was the superior version of that record. I will update this review when an SACD or “better source”…possibly the Pono Music is released in the future. 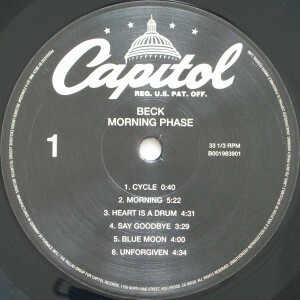 In my Opinion Beck – “Morning Phase” is his Magnum Opus. It is his best album by far and I listen to my best vinyl ripped 24Bit/96kHz every day it seems. It’s great when waking to get into a good mood, when going to sleep as it is super chilled, and still has the content to help a party kick it up a notch. 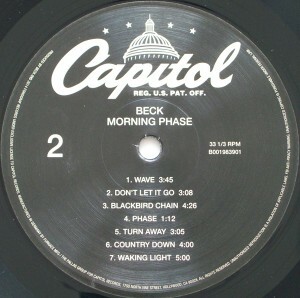 It has all these attributes, I see this as a timeless release and will be seen by future generations as Beck’s genius. Here’s the lead track called “Morning” ~ Utter Bliss! You can also see Bernie Grundman cutting the vinyl release @ Grundman Mastering Hollywood in a video [Direct Link] posted a few days ago in “The Playlist Night” part of this site below. I will be posting daily but you can also follow me on Twitter, Scoop.it, and Tumblr if you like. Let me know who you are and where we had contact via PM. Finally I sometimes post up to a day before I publish (Especially in “The Night Playlist Page”) so if you want posts in real time, you can add this site to your RSS feed bar by adding both the Day & Night pages separately (RSS Bookmark found in the lower right hand widget on each page), therefore as I post you will have instant access. This entry was posted in 2010's, A info, ADC Converter, Article, Audio Reference Music Server, Beck, Bernie Grundman, Bookmarks, Bootleg, CD, Christmachine, christmachine.com, DRM free, HD Tracks, Head Fi, Hearthrob, noobie, Open Source, Pallas Pressed, Pono, Pono Ecosystem, Pono Music, Pono People, Reviews, Robert Ludwig, Studio Masters, Todays Favorite Videos, Underground, utube, Video, Videos, Vinyl, Vinyl Rippers, Vinyl Rips, Youtube and tagged 2010's, A info, ADC Converter, Article, Audio Reference Music Server, Beck, Bernie Grundman, bookmarks, Bootleg, CD, Christmachine, christmachine.com, DRM free, HD Tracks, Head-fi, Hearthrob, Morning, Morning Phase, noobie, Open Source, Pallas Pressed, pono, Pono Ecosystem, Pono Music, Pono People, Reviews, Robert Ludwig, Studio Masters, Todays Favorite Videos, Underground, Video, Videos, Vinyl, Vinyl Rippers, Vinyl Rips, Youtube by admin. Bookmark the permalink.